UPDATED: Fri., April 13, 2018, 10:10 p.m. 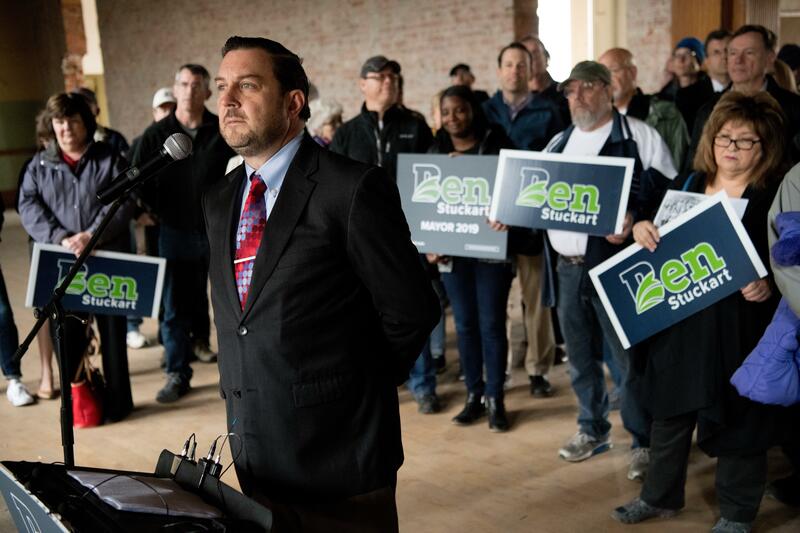 Many of those supporters held signs announcing Stuckart’s return to a mayoral campaign that he suspended while pursuing Eastern Washington’s seat in Congress last year. Stuckart dropped out of that race in June, citing family health concerns, but said his family has given him the go-ahead now to pursue the mayor’s office. Both he and Mayor David Condon will term out of their current positions in city government at the end of 2019. Stuckart said he made his announcement at the McKinley School, a two-story brick building built in 1902, now set for redevelopment by Rob Brewster as a mixed-use facility with a brewery, because it encapsulated the current state of Spokane. The at-times aggressive leader of what’s seen by political rivals as a progressive City Council supermajority, Stuckart has drawn criticism from conservative corners of Spokane for pushing policies on earned sick leave pay, taxing guns and ammo for mental health care services and floating a potential fine for coal and oil trains traveling through downtown. Stuckart acknowledged he was a “flawed candidate” who would have a long legislative record for potential political foes to pick apart. He did a bit of that himself, criticizing his own decision to place boulders beneath the downtown freeway overpass to discourage homeless encampments. Stephanie Cates, outgoing chairwoman of the Spokane County Republican Party and a frequent critic of Stuckart’s at City Council meetings, said his policies weren’t right for Spokane. Sales tax receipts soared in 2017, outpacing the state in most months and prompting the City Council to set aside additional money in reserve as part of its budget process. Though critical of some decisions and actions of Condon and his administration, most recently the dismissal of former Planning Director Lisa Key, Stuckart has cited an improved working relationship with Condon in recent months centered around $52 million in public investments downtown and beyond. “This is not a political announcement that bags on the current administration,” Stuckart said. “Despite our differences, I believe Mayor Condon has made positive steps forward for our community,” he added. Tedesco said Saturday he’s ending his campaign and endorsing Stuckart. In an interview last month, the 53-year-old Poole said he would be most concerned in office with tamping down government spending. “I want to be a fiduciary steward of the taxpayers’ money,” said Poole, who said in his first 90 days he’d audit all city departments to look for wasteful spending. Poole has not run for any other political office but has raised the most money so far of any mayoral candidate, sitting at $1,865 in contributions on Friday, according to state reports. Before November 2019, those figures are likely to go up. Condon raised more than $400,000 in support of his most recent mayoral bid in 2015, though Stuckart ushered through changes to the city’s campaign finance laws last fall that put additional restrictions on committees and individuals making contributions in municipal races. Chris Schroll, an alumnus of Eastern Washington University, has also filed to run, but has yet to report any campaign contributions. Schroll’s platform includes a call to repeal Spokane’s “sit-lie” ordinance, a law that is intended to prevent loitering on downtown sidewalks but that has been criticized as a way to criminalize homelessness in town. John Lemus, former chairman of the Spokane Human Rights Commission, had filed to run for office but announced on Facebook on Thursday night that he’d be abandoning his campaign in light of Stuckart’s interest. Stuckart said he’d continue serving as Spokane City Council president during his mayoral run, and that campaigning would not affect his work on the council. Editor’s note: This story was updated on Saturday, April 14, 2018, to note that Mike Tedesco has ended his mayoral campaign, corrected party information about Chris Schroll and fixed incorrect information about when Mayor David Condon’s and City Council President Ben Stuckart’s terms end. Published: April 13, 2018, 1:15 p.m. Updated: April 13, 2018, 10:10 p.m.